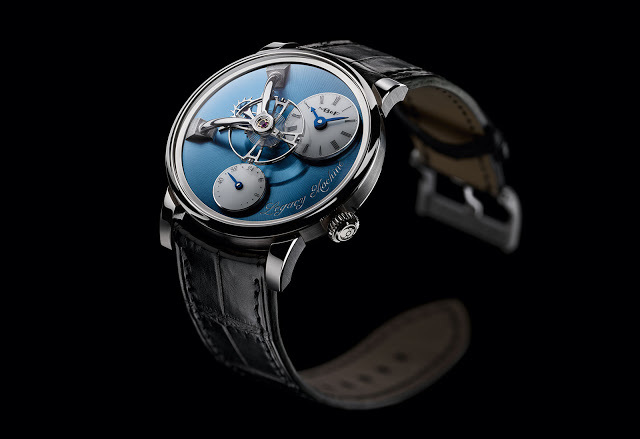 The latest iteration of the entry-level MB&F Legacy Machine has just been revealed: the LM101 in platinum with the trademark pale blue dial, limited to just 33 pieces. You’ll find specs and price below. Originally unveiled as the most affordable MB&F “machine” – a title it has since ceded to the HMX – the LM101 is now available in platinum. 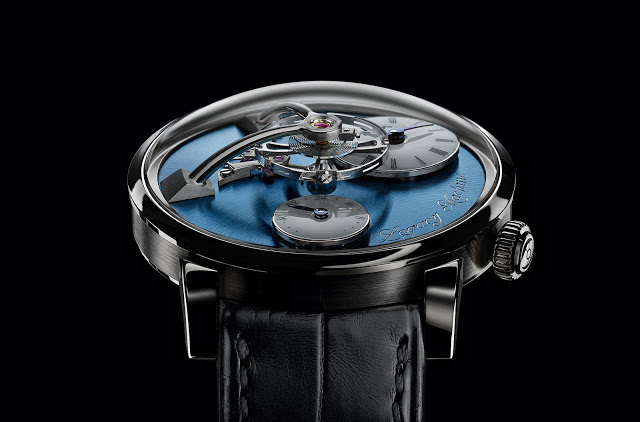 And like all other platinum Legacy Machines, the newest LM101 has a striking blue dial. 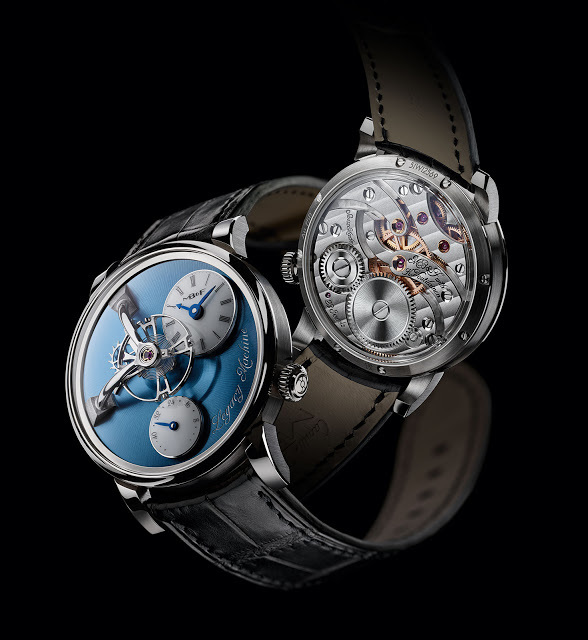 It will be officially unveiled at SIHH 2016, where MB&F will be an exhibitor, along with eight other independent watchmakers, for the very first time. Besides the case metal and dial colour, the new LM101 is identical to its 18k gold siblings. Inside is a hand-wound movement with a classically inspired design featuring undulating bridges and jewels in gold chatons. 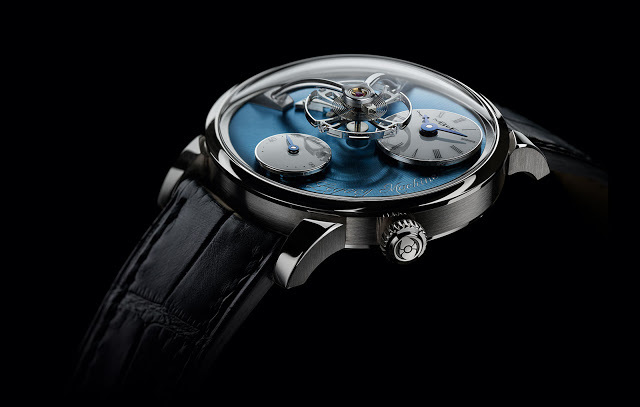 It was developed in-house by MB&F, but with the help of Kari Voutilainen for the finishing techniques and look. Its most distinctive feature is the oversized balance wheel over the dial, with the sub-dials for the time and power reserve below. 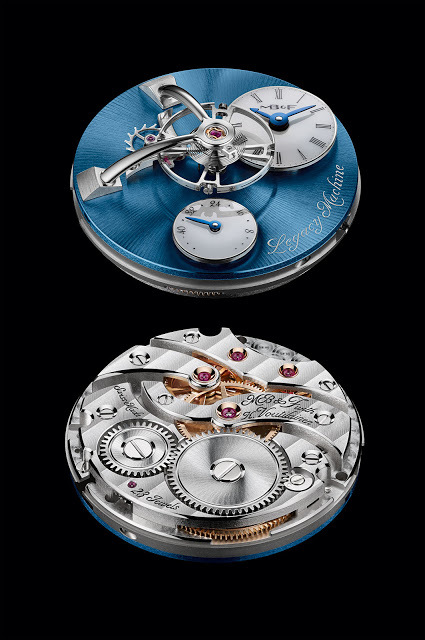 The case is a modest 40 mm in diameter, and some 16 mm high, with most of that height due to the large domed crystal to accommodate the arched bridge for the balance wheel. While the 18k gold versions of the LM101 are part of the regular collection, the platinum model is limited to 33 pieces, priced at SFr68,000 before taxes.